Plenty of time, even plenty of space (a nice (if too high) desk, a comfortable chair), light and an outlet—the promise of an internet connection—but with out the drivers and permission—no connection! I wrote a post—but in re-reading it.. I scrapped it. So... starting again. 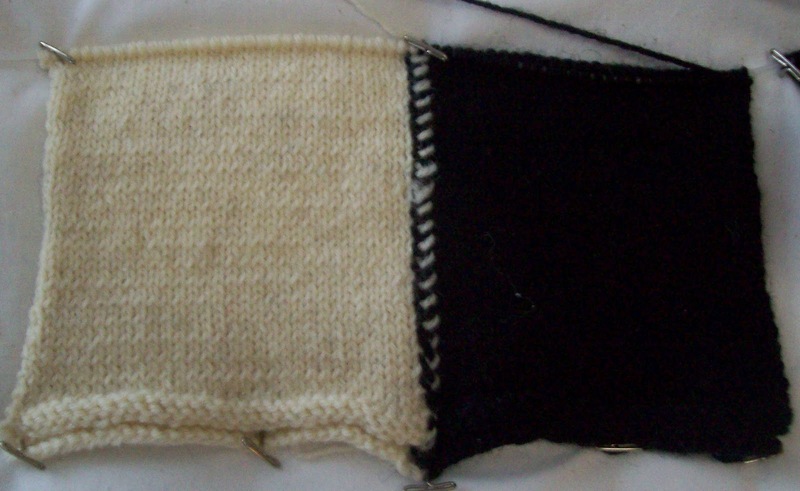 I knit—LOOK—Black and White cookie socks have 5 inches of the leg knit! That's real visible progress from when last seen. If I had continued knitting an inch or so a day, the leg portion of the sock would be complete by now. The knitting is pinned because, d'oh, stocking knit curls. Once the back seam gets sewn up, that won't be a problem. And Leafy Vest? It, too, is coming along. Now there are 2 tiers of leaves—And soon I will put some stitches aside for the sleeves--(will there be sleeves.. Yes, I think so, even if just short ones) and will soon start on the body of the vest. (Remember, my dressmakers form is a size small (about a jr's size 3—and I am not! The yoke looks near done on form—but....) The stitch count has more than doubled at this point--and there are still more increases to be made! Thursday, Just a Though asked if there was a pattern, or if I was making it up as I go..
the answers is YES— and NO. The basic (underlying) pattern is a top down, seamless raglan style. There are hundreds of free patterns for this type sweater, (and sites that will generate free patterns to size). 1-- a provisional cast on (the neck will be finished last, and will be (hopefully) a nice deep collar. 2—Instead of 8 neatly lined up increases (that create the strong lines of a raglan style sweater) I am increasing 16 times every 4th round, and NOT consistently lining them up, (so they are not creating strong visible lines) for a rounder shape to the top of the sweater. 4—There is front band—but the vest will have hook and eyes for closures, not buttons. So A, the band is narrow, and B, I don't have to figure out buttonholes—Which makes designing a bit easier! So YES, the pattern is made up as I go... but NO, its not amazing—I am working with a known formula, and just adding some bells and whistles. 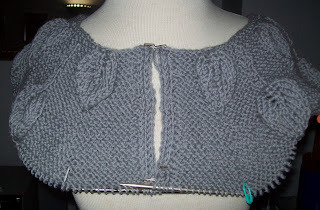 After the yoke of the sweater is complete, I will change from garter (which is especially effective for making the raised leaf motif “POP”) and work the body of the sweater/vest in stocking knit. Garter works effectively in the yoke—but I think a smooth body is more attractive—and besides, stocking knit is LONGER (in effect) than garter, so getting a long body (which I want) will be faster to knit in stocking knit. I haven't decided yet on bottom edge—It might be ribbing, or it might be hemmed. It really depends on how well the yardage goes. I am on my second skein—and feeling more confident I have enough wool—but it's still early days! I also like keeping my options open when designing a new pattern.